1. What is File History? File History was introduced in Windows 8, and gives you a new way to protect your files. File History regularly backs up versions of your files in the Documents, Music, Pictures, Videos, and Desktop folders and the One Drive files available offline on your PC. Any time your personal files change, there will be a copy stored on a dedicated, external storage device of your choice. File History continuously protects your personal files stored in libraries, desktop, favorites and contacts folders. It periodically (every hour by default) scans the file system for changes and copies changed files to another location. Over time, File History builds a complete history of the changes made to any personal file. 2. How to use File History to back up your files? Now I am gonna show you how to enable File History inside Windows 8, and then once its enabled how to configure it in order to back up your data. it can be configured for recovery of important files from folders, that can include Favorites, Contacts, Libraries, etc… This feature is not enabled by default inside Windows 8, because backup location needs to be selected before user enable it. This backup location is usually considered as an external hard drive or network location. This tutorial will show you how to enable it first, and then configure this feature to back up our data. Step 1: First you need to connect your computer with USB drive on which you want to save your backups. Step 3: From File History main window, click on Turn on button located in bottom right and close the window. 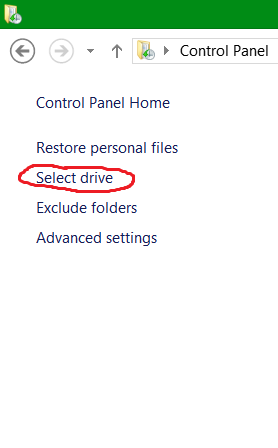 Step 4: If you click on Select drive located in left navigation you can choose a another drive or network location. 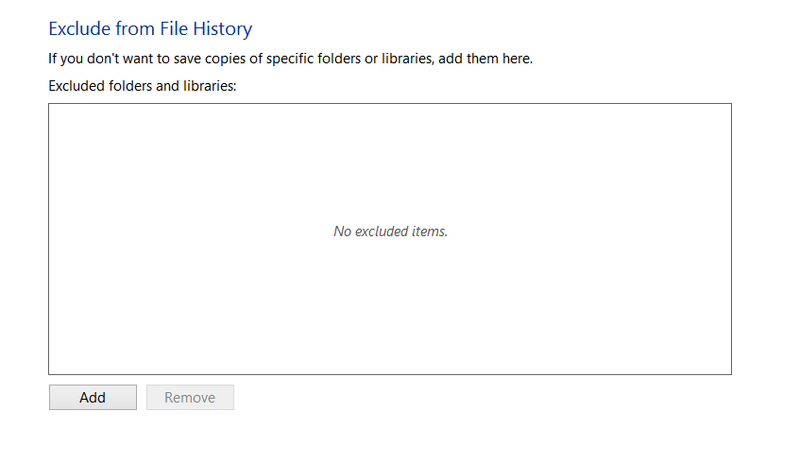 Step 6: If you click on Exclude folders, you can specify a group of folders which you don’t want to back up. For example you can exclude Pictures library or Music library since they can take a lot of space on your drive and may not contain documents that are important for your business. 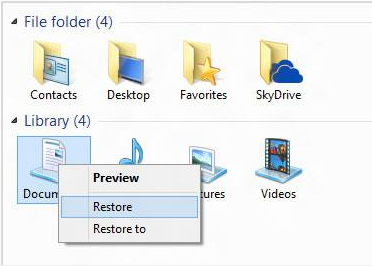 Step 7: If you wish to recover any deleted file from your computer, from left navigation click on Restore personal files link. Step 8: Select all the files you want to restore by pressing Ctrl on your keyboard and left mouse click on any folder or file. Then right mouse click on any of those files and from context menu that appears choose Restore (it will restore it to the original location) or Restore to (or choose the new location). This feature will certainly help you keep your documents and files secure in case of system failure so make sure you keep it running in the background.